Evening everyone! I know this week I have been a little AWOL. It has been crazy busy! It has been one of those weeks that seems like it is taking forever to end, yet it seems like you can’t keep up and everything is moving too fast! You know what I mean? Anyways, on to the food…We ate most all of my meal plan from last week, minus the hotdogs and shrimp alfredo. Instead we had leftover night Wed, random pasta night Thursday (hence the pasta frittata), and Friday was Marco Pizza (thin crust hawaiian and one 1/2 cheese 1/2 black olive and mushroom). Tonight, the girls ate leftover pizza and a bowl of cereal. Random! 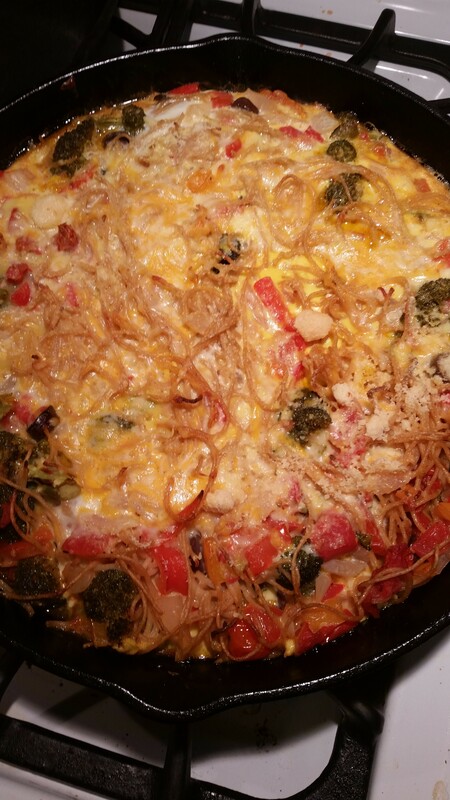 I choose to make the most of my leftover pasta and veggie tomato sauce by making this leftover pasta frittata. Cooked pasta (I had whole wheat spaghetti), sauce (I made a sauce that consisted of onion, garlic, halved cherry tomatoes, 1/2 each of yellow and red pepper chopped, sliced black olives, broccoli florets, 1 can diced tomatoes, salt and pepper to taste). cheese- I used some shredded cheddar, mozzarella, and parm, enough to cover the top, maybe 1 cup in total. In a large cast iron skillet or oven safe dish, start warming your pasta and sauce. Whisk your eggs with some salt and pepper. Add them to the pasta. Stir around. Top with cheese. Let cook for 5 minutes or so. Put the pan in a 375 oven and bake for 25 minutes or until your cheese turns golden brown. Set out of the oven and cool a bit. Great way to have pasta leftovers!